We wrote this book because it hurts our hearts when we see people struggle financially. We’ve been in those shoes and know how painful it can be. We also know that when you know better, you can do better, and that all parents want a better future for their kids.Parents teach their kids to walk, talk and brush their teeth. 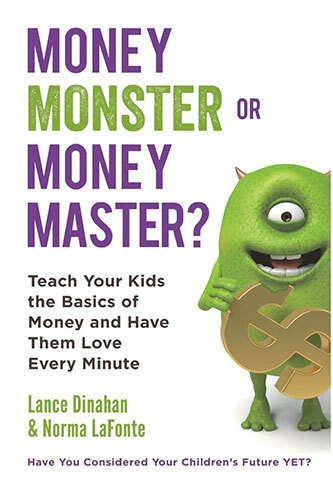 Our book guides you to teach kids the habit of good money management skills from the time they start recognizing what money is and what it can be used for. To be honest, its not that hard to do, but realistically, few parents know how, or what, to teach their kids about money. Our parents were good and kind-hearted people, but no one taught them, so they didn’t teach us. Likely you have had the same experience.Learning money lessons, the hard way, is the hardest way of learning, and we want to help you avoid that path for your kids. Our book makes it fun and easy – and many adults learn a thing or two along the way. Taming or destroying any Money Monsters in your life is simply a bonus of applying what you learn from reading our book.Take control of your future today – buy our book, apply the lessons and share what you learn with others. Let’s make a difference together!